The Mission of the East End Seaport Museum and Marine Foundation in Greenport is to recognize, restore and preserve the maritime heritage of the East End of Long Island, New York. Paul Drum is the Unofficial Mayor of the North Fork. 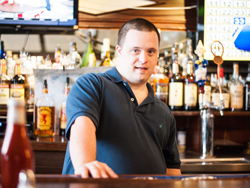 He is a champion basketball star, music enthusiast, avid sports fan, assistant restaurant manager, and a thriving joyful young man living with Downs Syndrome. On Sunday September 21st Paul will also become a philanthropist. Paul will be hosting his first fundraising event for the East End Seaport Museum and Marine Foundation during the annual Maritime Festival. The event is called “The Paul Drum Breakfast Fundraiser: A Mermaid and Pirate Experience.” Paul’s family restaurant, Front Street Station, will host the event with proceeds going to the newly founded Paul Drum Nautical Education Program at East End Seaport Museum and Marine Foundation. I first met Paul, or PTM (“Pauly the Man” as he likes to be called) during the Museum’s Chowder Contest this past June. Even though the wonderfully tasty chowder served at Front Street Station didn’t win first place, Paul Drum did! During the days that followed the contest it was unanimously decided by this close knit community that, had their been an award for most-beloved competitor, Paul would have taken it hands down. His enthusiasm drew us all in! In a recent conversation his mother, Sharon Sailor, joked with him about his ever-growing popularity. “He’s getting chummy with my competitors,” she teases. “They just might want to steal you away, Paul.” With these words, we get the full Pauly smile and laugh. He likes the idea and the popularity. You may know Paul best as the former doorman of DoLittle’s pub in Mattituck where he worked alongside his mother and grandfather. At their new Greenport pub, he has been promoted to assistant manager, a job that Paul tells me changed his life, improved his health and gave him “something good and important to do.” Paul says, “I love food and I love all the people.” Sharon adds, “He knows everyone from 15 to 92 years old. ” Born in Southhampton Hospital and delivered by the same doctor that delivered his mother, Paul has been charming everyone on the East End for 29 years. When I ask Paul, “If you could do any other job, what would it be?” he quickly responds with the answer “I would play basketball for the Knicks” and further explains, “Carmelo Anthony is a great 3-point guy, but he’s getting a little old, and I think I could be better.” I start to believe him as he and his father share stories about Paul hitting half court shots with ease and being the three-point “go-to guy” for the East End Falcons. The Falcons are reigning champions of the League. Paul’s eyes light up as he tells me of a playoff game in which the coach directs the team to give him the ball in the final 12 seconds. He decides to wind down the clock with a little fancy footwork and then pops off a swishing three-pointer at the final bell to win 43 to 42. I can’t help but stop taking notes at that moment and give him a high five! Again his enthusiasm wins my heart. Getting to know him, I start to question the word “disability.” I look up the synonyms for this word, and I’m right. Not one definition applies to the person I see in Paul Drum. I see no lack, no weakness, no disadvantage nor affliction. I see someone who has changed my life for the better in a short period with only the pure joyful desire to be my friend. I notice every person walking into Front Street Station looks around to find “Pauly The Man.” They ask how he’s doing, share a smile and a handshake. They too have come not only for a good meal, but for the joyful enthusiasm as well. The word of Paul’s fundraiser has been spreading in the community. In a synchronistic turn of event, Greenport Mayor David Nyce catches wind of the unofficial title Paul wears as “Mayor.” He asks if Paul wants to make it official. So, on September 21st, the day of his inaugural Fundraiser, Paul Drum will become “Honorary Mayor Drum for the Day” When Paul hears this news he is overjoyed, although he quickly tells me he would really like be a “Fireman for a Day.” That thought fades when everyone starts to congratulate him on the new status. Purchase Tickets for Pauly’s Breakfast Fundraiser here. If you can’t enjoy breakfast with Paul and his family, you can still donate to The Paul Drum Nautical Education Program. Funds raised will support and promote water safety and education for children. Keturah Hurst is also a freelance consultant for The East End Seaport Museum and Marine Foundation as a special event coordinator.